Usually the first step in Foreign Material Exclusion is to set up a zone where material will be controlled. In a manufacturing site, that zone could be around specialized manufacuring equipment. In high rise construction that zone is anywhere that is elevated. In engine or turbine manufacturing that zone is set up around an open engine. Depending on zone size and location, different methods will be used to set up the zone. In any case the zones are distinguished and identified by FME Barriers. Barricade tape provides a boundary where signage alone simply isn’t enough. It is good way to temporarily block access to a site that will only be worked on for a short period of time. Workspaces that are larger than a few feet can be identified effectively with barricade tape. The barrier or barricade tape should fit the color scheme and clearly mark the boundaries of the FME Zone. Text such as “FME Barrier” works well. Signage should be included at intervals around the barrier to indicate that the area is being protected from debris. An FME barrier for an area that is located in a central area with little visual or physical separation from the surrounding elements requires a lot of barrier creation. In addition to clear signage and barrier tape, the zoned area may also require stanchion setup. Stanchions are great barriers for longer term work, when simple barricade tape may not last as long as the job itself. Again, signage should supplement the stanchion barrier. Some FME jobs may employ the use of water filled or concrete barriers to form more of a permanent barrier. We have many options to enable you to safely secure your FME zone below. Where mechanical handling equipment is used, OSHA states that sufficient safe clearances shall be allowed for aisles, at loading docks, through doorways and wherever turns or passage must be made. Aisles and passageways shall be kept clear and in good repairs, with no obstruction across or in aisles that could create a hazard. OSHA Program Directive #100-60, pertaining to the safety markings for aisles and passageways in a workplace specifically provides an interpretation of "appropriately marked" as applies to permanent aisles and passageways where there are dirt floors or floors having continuous concentrations of sand or fine dusts. In some instances, this directive has been narrowly interpreted to mean that aisles and passageways must be marked by painted floors lines. According to OSHA, the intent of "appropriately marked" is not to restrict the markings to one method only. It would be impractical to paint lines on dirt floors or floors that have continuous concentrations of sand or other dusts. These conditions may exist in such industries as foundries, scrap salvage operations or motor winding facilities. They go on to state that painted lines remain the most feasible method of marking, where practical, since they may last several years without maintenance or repainting. Other appropriate methods such as marking pillars, powder stripping, flags, traffic cones, safety tape or barriers, stanchions or barrels are acceptable, when the training programs for vehicle operators and employees include the recognition of such markings. Our large selection of crowd control retractable belt signs, queuing post signs, and signage systems ensure the perfect signage solution to meet your unique needs. From simple post-top signage to stunning 28" x 22" poster size signs we have a solution to direct people moving in, through, and out of your facility in a safe and orderly manner. These signs fit directly on top of your existing stanchions and posts. If branding and advertising is an important element of your business strategy, we have a variety of solutions for stand-alone systems or opportunities to promote right in your queue, leveraging existing floor space. We carry an exclusive line of sign frames that mount right on top of crowd control retractable posts and rope posts. These frames can come with radius corners, eliminating sharp edges near your customers. Each frame can accept standard or custom sign inserts or can come with twin clear acrylic panels designed to accept regular paper media. Our elegant sign stands come in a variety of designs featuring unique scroll shapes to simpler, more standard designs. We also offer wall mounted sign frames, changeable letter displays and menu display frames. Each frame can include twin clear acrylic panels designed to accept regular paper media, allowing you to quickly change signs by printing them out frequently on your computer. We offer a wide selection of standard sign panels that provide an easy means of communicating with your customers and fit in all our sign frames. With our rapid in-house sign making capabilities, your custom message or graphics are just a phone call away. Stanchions and crowd control posts come in many varieties today. There are disposable stanchions, meant for “Black Friday” promotions, 3-day holiday sales and grand openings (not recommended for long term use over a year.) 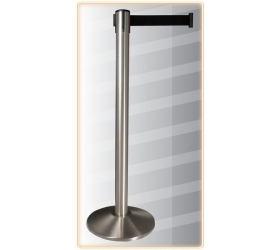 There are mid-grade stanchions which are great for indoor locations such as restaurants, churches and pharmacies (not recommended for high traffic areas or outdoors). And there are high-end stanchions which are recommended for high use areas, airports, casinos, movie theaters, museums, stadiums, construction sites and outdoor use. A strong mid-grade stanchion is our Line-King line of stanchions, posts and accessories. Crowd control products by Line-King offer a broad range of finishes and customization while maintaining incredibly low prices. Each product has been designed by an established US manufacturer with over 20 of years experience in the crowd control industry. Design flaws of other low-cost imports have been corrected in order to provide a product that will outperform any other mid-grade stanchion on the market. High volume items are kept in stock while others are assembled in the U.S. to provide the fastest delivery possible. There are many options when it comes to crowd control products. 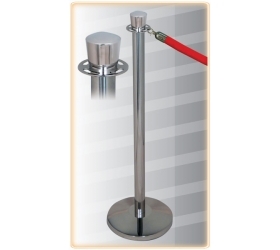 No one else can offer such a wide range of feature packed stanchions that ship quickly at a better price. Don’t get stuck with a post that only works with itself; our products will work with your existing and future stanchions. 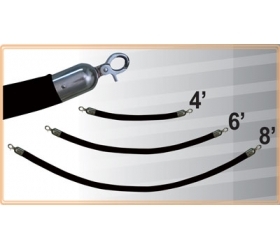 Be sure to browse our site to find our wide range of TensionLine retractable belt stanchions and wall mounts, MajesticLine Post and Rope stanchions as well as accessories for our crowd control products. TensionLine stanchions by Line-King include all of the features you expect in a retractable belt stanchion at a price that can’t be beat. A safe retracting brake, universal belt end, and simple no-tools-required assembly ensure a safe and trouble free product. These posts are shipped two per box, knocked down to save up to 50% on shipping charges. They are available in a variety of standard finishes and belt colors with customization available. MajesticLine posts and ropes by Line-King are the most affordable way to tame your line with a touch of elegance and class. Each post includes a thick and durable rope attachment ring that has smooth edges for customer safety. They are shipped two per box, knocked down to save money on shipping charges and the simple assembly can be done in seconds with no tools required. Our sign frames for the TensionLine and MajesticLine posts include everything you need in one convenient kit at a price that can’t be beat. Each frame includes (2) pieces of acrylic to protect your sign as well as a durable universal adapter to attach to almost any 2-1/2” diameter stanchion. You can choose to order one of our 9 standard message signs, have us make a custom message sign, or print your own 8-1/2” x 11” paper sign without the added cost of a custom sign shop. Belt Printing allows you to add your logo or message to our stanchions. Two methods are available to get your message on the belt. We silkscreen simple graphics with one or two colors. Dye sublimation printing is available for multi-colored, complex graphics. Line-King stanchions and posts are the most customizable and low-cost mid-grade stanchions and posts available on the market today. The water-cable barrier system is a plastic, water filled portable longitudinal barrier used on the National Highway System to provide positive protection in the work zone. This type of barrier has several advantages over other water filled barrier products. The high level of internal impact energy attenuation requires no externally added steel. The water-cable barrier utilizes water dispersion upon impact in combination with internal molded-in steel cables. Upon impact, the plastic container ruptures and disperses the contained water. Simultaneously, the internal steel cables provide the strength to safely catch the misguided vehicle like a net preventing vehicle intrusion into the work zone. Our water-cable barrier system is accepted as a longitudinal barrier and as a longitudinal device and meets NCHRP-350 crashworthy test requirements for TL-1, TL-2 and TL-3. This multi accepted product eliminates the identification and mislabeling of products between barrier, device, or barricade. The water-cable barrier meets all industry needs with one product for all applications at all test level speeds. There is no need to keep variants for different speed levels, sizes, or applications in inventory. Our water-cable filled barrier system is designed to form a series of individual sections linked together to function as a portable longitudinal barrier to keep vehicles from penetrating the linked barrier sections. This barrier provides a positive separation between vehicles on the roadway and workers in the roadside work zone. When an impacting vehicle contacts the water-cable barrier, the water and internal molded-in steel cables act together to re-direct or bring the impacting vehicle to a controlled stop. The system utilizes water dispersion upon impact in combination with internal molded-in steel cables. Upon impact, the plastic container ruptures and disperses the contained water. Simultaneously, the internal steel cables provide the strength to safely catch the misguided vehicle like a net preventing vehicle intrusion into the work zone. All sections are orange or white and contain internal molded-in steel cables. Our water-cable barrier meets all industry needs with one product for all applications at all test level speeds. There is no need to keep variants for different speed levels, sizes, or applications in inventory. High quality, commercial grade plastic, water filled barriers are a new, innovative and safe approach to traffic control, construction and security. Applications for water filled barrier walls include construction areas, work zones, crowd control, temporary road blocks, public works projects, special events / sporting events, traffic channelizing and control, security, and pedestrian protection as well as many other unique uses. The barrier system is a cost effective, portable energy absorbing water filled barrier wall system that increases safety and security around work zones, moves traffic through construction areas, and provides protection for drivers, workers, pedestrians, and equipment on and around the job. 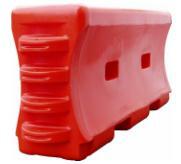 The barriers are a heavy duty plastic channelizing system that is larger and more visible than barricades, cones, or barrels - effectively alerting drivers to changing traffic patterns and work areas. This system meets the day to day needs of local governments and businesses involved in construction, public works, safety, and security. Each barrier has two built in sign post stabilizers (one at each end) to accommodate signage or fence posts allowing you to add chain link fencing on top of the barrier. Our bright barriers serve not only as a barrier to protect drivers, but also as warning signs. Bright colored barriers make most people lower their speed significantly in comparison to the concrete barriers. The water filled barriers can also be emptied of water and moved by hand, no forklifts needed. This is an excellent system for traffic control that can be moved during a project. The durable polyethylene plastic prevents cracking and breaking. Molded through forklift holes eliminates bowing when filled with water. The double wall knuckle design prevents breakage at hinge point. The hinge design allows for a 30-degree pivot between sections. The 8" fill hole speeds filling process and includes a twist-lock plastic cap. The large tamper proof plastic threaded water release drain and plug at bottom corner are easy to access. The water barrier wall includes one steel-connecting pin that allows sections to be locked together. The forklift and pallet jack through holes and recesses allow for easy movement. The walls come in either orange or white colors and can be used in alternating colors to really stand out and provide superior protection. Wall mounted retractable belt units are the perfect solution for situations where a flexible retractable barrier is required for crowd control without taking up floor space. They are commonly used in a variety of crowd control settings including airports, multiplex theatres, restaurants, shopping malls and banks. Wall mounted retractable belt units are available in a variety of finishes including steel and powder coated finishes. They come in many different belt length options from 7'6" all the way to 50' length, for closing large span applications such as parking garages, loading docks, driveways and tarmacs. These wall mounted retractable belt units have a variety of mounting options to suit different applications – all are easy to install. And they also come with a wide selection of belt ends allowing you to use them in just about any crowd control configuration. The wall mounted units come with universal belt clips standard on all automatic units, allowing easy connections to standard receiving ends and most other retractable belt posts. Warehouse units come with an "S-hook" belt end which attaches to warehouse shelving or wraps around poles and connects to itself. Any wall mounted unit can be configured with an optional "S-hook" belt end. Belt ends can also be configured with a magnetic belt end, allowing you to attach the belt end to magnetic surfaces without a receiving end or a suction cup belt end which attaches to glass, ceramic or metal surfaces temporarily. Extra mounting plates can be purchased for wall mounted retractable belt units, allowing you to use 1 unit in several locations. Mounting can also be done using a magnetic mounting plate, allowing a quick, nonpermanent attachment to warehouse shelving by means of a strong magnet and clip that hooks into holes or slots in most shelving units. In addition, you can also use a velcro mounting plate with velcro straps that allow for quick and temporary installation on any column or post ranging from 1-1/2" to 5" diameter (Longer straps are also available). Or use a hose clamp mounting plate with metal straps for a secure and semi-permanent connection to uprights. The standard length is adjustable from 2" to 5" diameter. And for temporary use on glass, ceramic or metal surfaces, you can use a suction cup mounting plate. For the ultimate in concealability, a recessed wall mount retractable belt unit comes with a steel plate that lets you hide the unit in the wall. A recessed wall mount unit with door completely conceals the unit behind a steel door when not in use. Concrete barriers are a significant part of any crowd control system. When you want to direct traffic, guide visitors into pathways, or keep them out of restricted areas, concrete barriers are the way to go. No longer do you have to put up ugly barricades. Today's barriers are as aesthetically pleasing as they are necessary to prevent terrorism. We also offer another option in barriers: concrete planters. With these you can mark garden spaces, create corners, define walkways, block vehicular traffic, and even add to landscaping designs by putting in park benches, concrete waste receptacles, and portable barriers. Your space will look beautiful, and the public won't even notice that the barriers are there to control the flow of traffic and provide security. Concrete barriers accent courtyards, bus stops, pedestrian walkways, parking lots, stadiums, schoolyards, and municipalities. 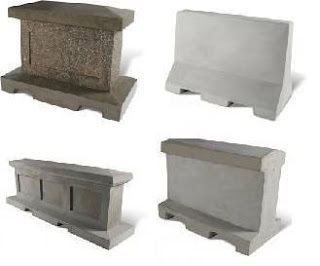 Create a perimeter with a series of concrete barriers, park benches, planters, and waste containers. You'll keep your crowd where you want them while they enjoy the eye-catching designs of our barriers. You can also use them to block restricted areas both indoors and outdoors. A large concrete object sends a "do not enter" message to vehicles and pedestrians alike. A stanchion doesn’t just have to be cheap and no frills. It can match your décor, be an extension of your marketing/branding department or be designed directly into your environment with unique and different heights, a fixed or removable mount or with a specific finish. The stanchions we offer at CrowdControlExperts.com can come in over 200 custom powder coated finishes. We offer brass options for all budgets including polished brass aluminum ($), brass plated ($$) and true brass ($$$) stanchions. We offer printed belts on your stanchions that can feature your logos, messages, advertisements or custom colors. Because we have a full manufacturing facility, we can modify any stanchion to meet your needs or custom build a specific product for you. Posts can be cut to any height and we can modify our wall mounted retractable belts to attach to anything including supermarket checkout grid displays, warehouse loading dock frames, or nuclear power plant machinery enclosures. We can also make signs to mount on your stanchions that have more than a single message. They can extend your branding on the top of every post and we can add panels between posts as large as 72"w x 34"h to allow you to create a custom branded billboard. Do more with your stanchions than just creating a barrier. Use them to extend your brand, merchandise your products, and integrate them into your sales environment.